Ensure stability and durabily with the right replacement parts for your brake model! 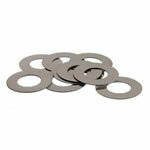 Duke Brakes carries a wide variety of replacement parts such as brake washers. Navigate our brands for part numbers or contact us for immediate assistance.